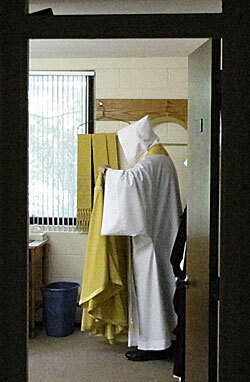 If you are considering a monastic vocation it is necessary to begin listening. This is easily done by praying- being in the presence of God and asking God what His will is for you. Be willing to place all your anxiety, fears and questions in God's hands and …listen. Another means of assisting you in your discernment is to write the vocation director, Br. Daniel, at vocations@glastonburyabbey.org who is able to help you on this journey. Seek out a priest or religious brother who has been on a similar journey. Come to the Abbey for a Come and See weekend, which will give you an opportunity to experience monastic life as it is lived here at Glastonbury Abbey. It is a time to speak with the vocation director who will help you in the discernment process. Inquire at the above email for future offerings. Many men are frightened as they begin this journey because it is a mystery and because we always want to be in control. A discernment journey is an exciting one because you have allowed God into your life at a deeper level. You have surrendered yourself to a God who loves you and is calling you to follow. Don't be afraid, only trust and God will do the rest if you …listen.